Now that they're safely ensconsced in Castle Twilight as the supreme rulers of Transylvania Waters, the Flood family of witches and wizards have decided to share their immense wisdomness, magic and bacon-orientated secrets and history with you - even though you are mere pathetic ... read full description below. Now that they're safely ensconsced in Castle Twilight as the supreme rulers of Transylvania Waters, the Flood family of witches and wizards have decided to share their immense wisdomness, magic and bacon-orientated secrets and history with you - even though you are mere pathetic humans. From Winchflat's Wonderful World of Inventions to recipes from Betty's restaurant to digging up (literally) stories about the Floods' obscure relatives, this book will make fans of the Floods giggle, guffaw and chortle for hours. 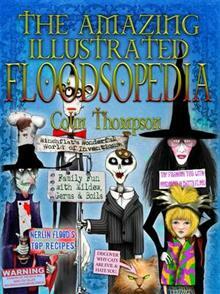 Fully illustrated and full colour throughout, FLOODSOPEDIA will improve your life in exciting and dramatic ways you never imagined, unless you imagined bacon, mildew, boils and germs.